Al Sumrall and Ian Whittaker requested to be co-Crew Chiefs for Old Pete (and its automotive Model A engine). Congrats guys! Al says their first order of business is to get the engine running, clean the aircraft up and source another sight glass fuel gauge. Ian and Al looked at the cracked fuel gauge for old Pete, identified the type and Al ordered a replacement from Aircraft Spruce that ought to be here before Air Fair. 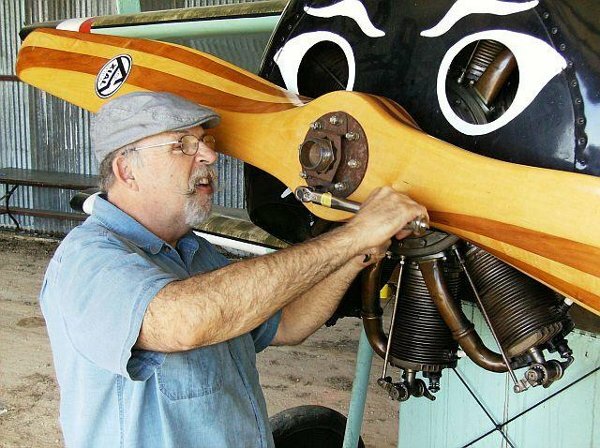 A small crew of guys consisting of Dave Edgerly, Ron Marcotte, and Steve Freeman finished off the Triplane, so it is essentially ready for engine tests and a return to the air. Items that needed attention were putting the engine cowl in place and ensuring adequate clearance for the engine to spin, and reinstall the prop - torquing the nuts properly and safety wiring everything securely. The final step was reattaching the cabane strut bracing wires, and while the guys were at it they measured the top wing and adjusted the cables to ensure the top wing was square and true. We should be able to fuel it up and start the engine in May! Steve Freeman, Dave Orloff, Dave Miller and Don Dixon spent much of the day putting the "new" engine in the Cub. They enjoyed great success and Steve hopes to finish the Cub off during the week before Air Fair with an assist from his brother Chris! Ian and Cameron Whitaker plus Al Sumrall met at Kingsbury to do vehicle work on the 13th. Cameron was involved in a lot of the work, but Ian worked cleaning up a carb and coaxed the vehicles into starting and running. Al mainly served as encouragement! Cameron finished up the Wrecker rebuilding the vehicle's electrical system and it now seems to run fine. He also added a new switch to the French Ambulance (a very discreet installation) as the Switch in the Frenchie had given up the ghost and is extremely expensive to replace, one of the few parts on a T that is surprisingly expensive. Cameron also installed a starter button on the Blue Racer that is hidden in the coil box. Ian and Al discovered that the fix to the Blue Racer's fuel tank had failed and made quite a mess. After temporary repairs were made, Lynn Howell's friend soldered up the leaking Blue Racer fuel tank to permanently seal the leak. The Blue Racer runs fine but is still having trouble getting sufficient power generated to go very fast in second gear. Cameron thinks the motor will be fine as it continues to break in, but at least it starts easily and runs smoothly! 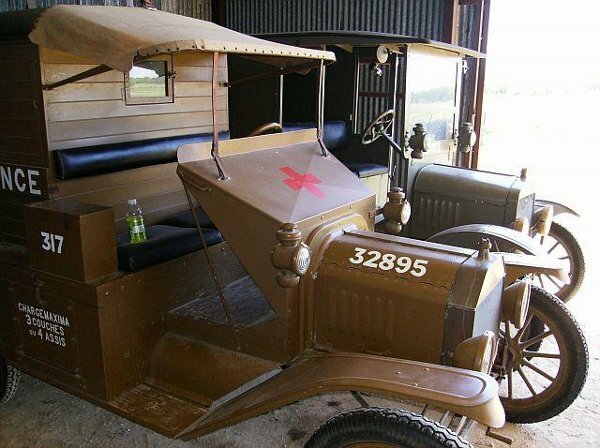 Cameron added oil to many of the Model T differentials and tightened up the steering on the Signal Corps truck. All in all, Cameron and Ian had six of the vehicles running on Saturday - all were test driven - and all are expected to be running for the air fair. The only vehicle not running was the TT as the terminal's connectors were broken and the parts house was closed. That repair will be made before Air Fair. Kevin Monahan finished the Triumph restoration and got the bike started again about a week before the Fly-In. All that remained was to finish the repair to the front fender. Kevin feels he has time for a quick fix only, but after Air Fair will take the fender home again for a proper fix. Dave Miller's wife laser printed copies of Carl Canga's flyer to distribute to post in the general area advertising the Fly-In. During lunch break Dave posted flyers at Ebbo's - formerly known as Edna's in downtown Kingsbury. In Luling flyers were posted in the Luling HEB, Apple Lumber Company, Blake's Restaurant, the two Luling BBQ restaurants, plus the antiques store in the old theater. On his way home Dave also posted flyers at a grocery store and the Shell station in Waelder. A bunch of the volunteers, Tom Miller, Terry Bledsoe, Dave Orloff, Kevin Monahan, Sam Miller, and John and Johnny Busch, walked the runway looking for debris and thorny plants. Very little was found, maybe because Allen sprayed months ago. The grass around the buildings was cut and trimmed, and tall weeds pulled. John Busch spent quite a bit of time mowing parts of the grounds. Lastly, the guys pulled an old cement mixer and a vintage grader out of the weeds and positioned them around the pavilion to add a little extra vintage flavor! The big mower deck on the Ford tractor wasn't working as too many sharp turns had caused some jackknifes and bent some thick plates holding pivot pins. The two Terry's, Beer Fairy and Bledsoe, and Kevin Monahan heated the bent plates with a torch and straightened the plates out returning the shredder to service. A day or so before the event Steve ran the shredder over the runway. Tom Moore got all the engines on stands lined up in the new hanger and made up some plaques briefly detailing the history of each engine. Tom also spent some time cleaning the cobwebs off the motors and sprucing them up a bit. The PFM was invited to send a few vehicles to Camp Mabry in Austin for their annual "Muster" event which was held on the weekend of the 21st and 22nd. On Friday, April 20th, Al Sumrall, his son Sam and Kevin Monahan went to Kingsbury to move the Indian, Triumph, Model T US Ambulance and the T-2 fuselage to Austin. A U-Haul van was rented to safely move the Thomas-Morse fuselage. Mabry needed to move a few of their own artifacts out of the building so Al and crew could set up the display. 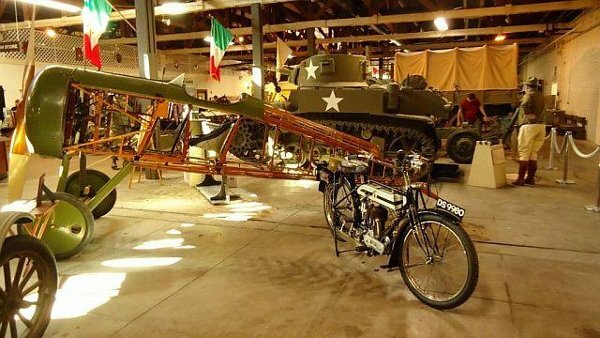 The last item moved was a Sherman tank that they started and drove out of the building. Al was extremely delighted to have a Sherman rumble by just three feet away! During the event everybody that walked in the museum building came to our display, with the Tommy drawing the most interest. Everybody was just amazed at the woodwork and the Le Rhone was the showstopper. Steve Richardson and Carl Canga plus a few acquaintances of Al's monitored the display, answered questions, and handed out flyers for our Air Fair! Carl and Kevin had to literally drag Al away at end of Sunday to make room for the tanks that live in the area PFM's display had occupied - Al was just having too much fun talking to the people. As it turned out Carl was running the Indian, the last PFM vehicle at the display, out the door while the tanks were rolling up the street! All in all the Mabry appearance was a successful outing for PFM.